Nature provides a wealth of greens, pods, twigs and more to brighten your holidays. 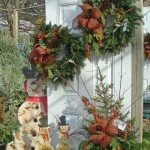 Give your entrance, porch or deck a special look with evergreen boughs, roping, wreaths, swags or containers embellished with accents found in nature. Hydrangeas, red twig dogwood, winterberry holly, and grasses can be grown in your yard and harvested for use with greens. The Growing Place offers many varieties of twigs, cones, berries and fresh cut greens including white pine, silver fir, incense cedar, boxwood, Port Orford cedar, shore pine and variegated arborvitae to provide a rich brocade of textures and shades of green. Browse under cover at either location. If you need inspiration, their creative design staff offers pre-made arrangements or is happy to create a custom look for you and they even make house calls. As you choose your greens for outdoors or inside, give them a light spray of Wilt-Pruf anti-transpirant product. This will help keep your greens fresh-looking longer. Apply the spray in daylight when temperatures are above 40 degrees and dry thoroughly so it doesn’t freeze on the leaves/needles and properly bonds to the surface. The spray creates a protective film so that the leaves do not lose as much moisture in the dry winter wind. Your fresh greens will last longest if they are protected from bright sun and harsh winds. For decorating indoors, you need to take safety into consideration. Fresh cut greens on mantles can be a fire hazard. Some greens will last longer than others indoors. Boxwood, oregonia, and fraser fir hold up best. A regular spritz of water will help keep them greener. Fresh green arrangements in floral foam should also be kept moist. The Growing Place offers a wide selection of naturalistic artificial greens as well. Bring the pine scent of Christmas indoors this year with a long-lasting fraser fir tree in one of your rooms. You can find them sized from 3’ up to 7’ at The Growing Place.